A snap shot of a normal word document is shown in following figure. 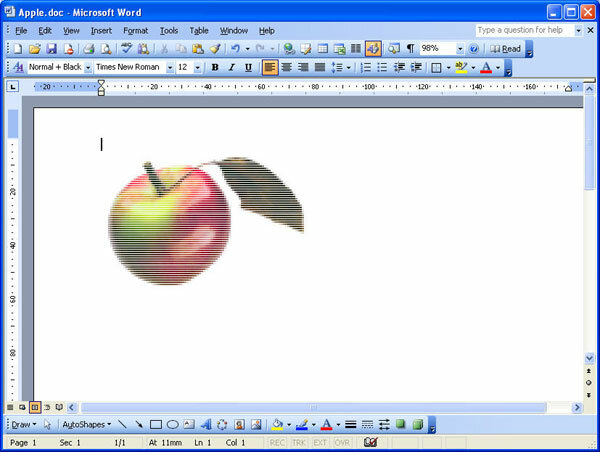 There is a picture of an Apple in this document. But is it a picture ? We will zoom the document into 500% and see. This is not a picture. It is a collection of 1's and 0's which are colored in various colors to create the following picture. The font size is 2. So it looks like a picture in normal view. How to create such documents? I have written a Visual Basic program for it. You can download it here. Just click the "Open Picture" button and load the picture you want. Then click the "Create" button. The program will create the document and open it. For large pictures this will take a considerable time depending on your system and hardware. Therefore for testing purposes please use a small picture such as Icon (with extension ".ico"). However the program will show percentage of completed while the document is being created. Your word document password will be "wmscreation". Once you feel it is going to take a long time, just click "Cancel" button. Then you will able to save and open the created part of the document. Probably you may need a latest version of "Microsoft Office Word" to run this program successfully. However this "Word Picture Creator" is rather slow. I have developed another similar application called "Text Picture Creator". This converts any picture to gray scale text file with 8 gray levels. 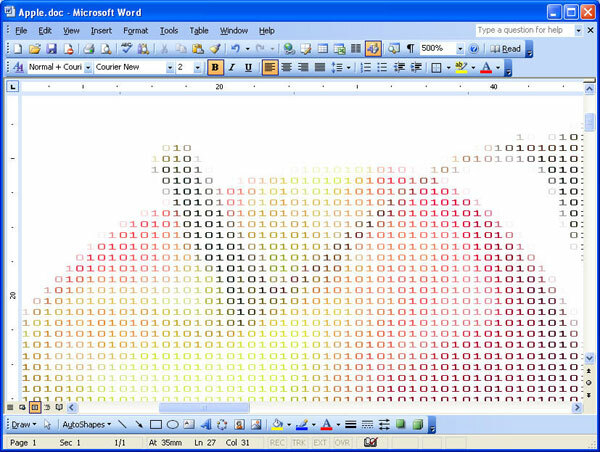 The program works exactly similar to "Word Picture Creator". For example consider the following picture. NOTE : Please minimize the windows when programs are in progress in order to speed up them.